Since 1929, when the Pope reached a deal with Mussolini, the Vatican has been an independent state, the world's smallest with only 0.44 square kilometers. But within its walls are enough attractions and things to do to keep tourists busy for several days, so prioritizing your sightseeing is important. The two must-see sights are St. Peter's Basilica and the Sistine Chapel, but the Vatican Palace contains magnificent rooms decorated by the greatest artists of their time, as well as priceless collections in more than a dozen museums. In addition to the major museums, smaller collections will appeal to specialized interests: the Museum of Secular Art's ancient sculpture, the Museum of Sacred Art's finds from catacombs and early Christian churches, the Map Gallery, a gallery of candelabras and tapestries, as well as objects brought back by missionaries, Papal carriages, vintage cars, and a collection of more than 800 works of modern religious art by Matisse, Dali, Munch, Rouault, and others. Discover the best things to see and do with our list of the top-rated tourist attractions in the Vatican. The centerpiece of the Vatican and one of the best places to visit, the magnificent St. Peter's Basilica was built between the 16th and 18th centuries, replacing earlier structures that began in 326 on what is thought to be where St. Peter was buried. Ironically, it was the selling of indulgences to finance this building in the 16th century that provoked Martin Luther to begin the Protestant Reformation. The work of famous artists begins before you enter the church: in the portico are an equestrian statue of Constantine by Bernini and fragments of a mosaic by Giotto above the main doorway. It's from the old church, as are the double bronze doors. The huge nave - 185 meters long and 46 meters tall - rises to a dome 119 meters above and can accommodate a congregation of more than 60,000. Compare it to the dimensions of other great churches marked in the floor. On your right, Michelangelo's famous Pietà, sculpted when he was only 24, is behind reinforced glass. Also on the right is the richly decorated Chapel of the Sacrament, with Bernini's tabernacle and his rival Borromini's bronze grille. Michelangelo's dome is held on four massive pentagonal piers, and below it, under Bernini's magnificent Baroque bronze baldacchino (canopy), is the Papal altar. 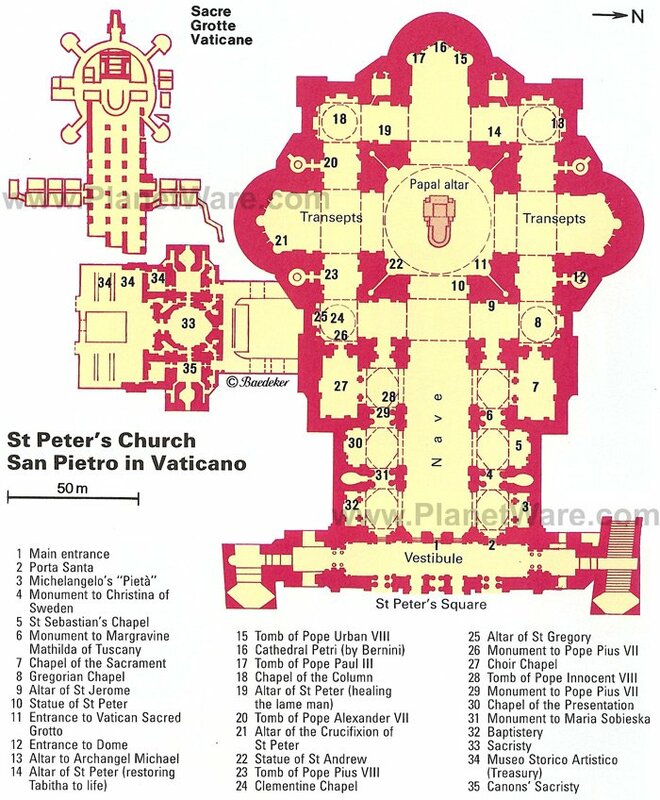 Below is the tomb of St. Peter. The bronze throne in the apse, flanked by papal tombs, is also by Bernini. Tombs of more Popes are in the right aisle. Near the Baptistery are the stairs (a lift is outside near the Gregorian Chapel) to the roof, from which you can climb 330 steep steps inside the dome to the lantern for a closer look at the dome's structure and magnificent views over St. Peter's Square. Beneath the church is Vatican Necropolis, the final resting place of several former Popes and said to house the remains of St. Peter himself. Built by Pope Sixtus IV in 1473-84, the Sistine Chapel is a rectangular hall, which is the Pope's domestic chapel, also used for services and special occasions. After the death of a Pope, the conclave to elect his successor is held here. The frescoes by Michelangelo and others covering the walls and ceiling, acknowledged as the pinnacle of Renaissance painting, were extensively restored from 1980 to 1994, removing layers of candle-soot, dust, varnish, grease, and overpainting to reveal their original luminous colors. The side walls are covered with large frescoes of Biblical scenes against the background of Umbrian and Tuscan scenery, painted for Sixtus IV by the most celebrated painters of the day - Perugino, Botticelli, Rosselli, Pinturicchio, Signorelli, and Ghirlandaio. These late-15th-century paintings already reflect the ideas of humanism, recognizing humans as individuals and important in the historical process. The left-hand wall shows Old Testament scenes; the right wall New Testament scenes. The frescoes on the ceiling were painted by Michelangelo, almost completely unaided by assistants, in the reign of Pope Julius II, between 1508 and 1512. Michelangelo's ambitious idea was to depict the Creation as described in Genesis, beginning with God separating light from darkness, creating the sun and the moon, separating land and sea, and creating Adam and then Eve, and continuing through the story of Noah. Below in the vaulting are colossal figures of the prophets and sibyls. Michelangelo began work on the large fresco on the altar wall in 1534, depicting the final scene in the story of the world, the Last Judgment. Its dramatic presentation and artistic finesse rank it as one of the greatest achievements of European painting. If you don't want to wait in long lines for your chance to admire the world's most famous frescoes, book a "Skip the Line" tour, which includes the Sistine Chapel, St. Peter's Basilica, and The Vatican Museums. These rooms, commissioned for the Palace of the Vatican's papal apartments by the art-loving Pope Julius II and later by Pope Leo X, are covered with a magnificent series of frescoes by Raphael. In re-discovering the traditions of historical painting, Raphael began an art tradition that was to be followed for centuries. In each of the scenes, he uses a classical symmetry in the composition, positioning the characters in perspective around a central focal point. While some scenes were painted by students or other great artists after his death, the Stanza della Segnatura and the Stanza di Eliodoro were both painted by Raphael himself, as were those in the Sala della Segnatura. Completed between 1508 and 1511, these works and those in the Sistine Chapel represent the supreme achievement of Renaissance painting. The paintings convey that period's culture in all its splendor and show humanist themes - the natural sciences attainable without divine revelation, philosophy, history, mathematics, civil law, and justice. Pope Alexander VI, a Borgia, had a private residence for himself and his family built inside the Vatican Palace, known today as the Appartamento Borgia. Between 1492 and 1495, Pinturicchio and his assistants painted a series of scenes that combined Christian subjects with ancient and Renaissance humanist themes. The first room shows prophets and Sibyls; the second, the Creed, with prophets and Apostles. The third room is decorated with allegories of the seven liberal arts, and the fourth with legends of saints. Scenes from the New Testament cover the fifth. It's easy to miss this little gem as you leave the Raphael Rooms and go through the Sala dei Chiaroscuro, where your attention will be on the wooden ceiling. But in the corner is a small doorway to Nicholas V's Chapel, also known as Cappella Niccolina. It is completely lined in frescoes by the Florentine monk of the early Renaissance, Fra Beato Angelico. The subjects of the frescoes are the life and martyrdom of St. Stephen and St. Lawrence, and like all Fra Angelico's work, these paintings speak of a deceptive simplicity, gentleness, and devotion that almost makes you overlook the genius of this talented artist. Even though it was robbed of many of its treasures by Napoleon, the Pinacoteca contains 16 rooms of priceless art from the Middle Ages to contemporary works. Arranged in chronological order, the pictures give an excellent survey of the development of Western painting. Medieval art includes Byzantine, Sienese, Umbrian, and Tuscan paintings, as well as a Giotto triptych and a Madonna and St. Nicholas of Bari by Fra Angelico. There is a triptych by Filippo Lippi, Coronation of the Virgin by Pinturicchio, and a Madonna by Perugino. A room is devoted to tapestries from cartoons by Raphael; his Madonna of Foligno; and his last painting, the famous 1517 Transfiguration. Portraits include da Vinci's unfinished St. Jerome, a Titian Madonna, and Caravaggio's Entombment. The grand Piazza San Pietro in front of St. Peter's Basilica was laid out by Bernini between 1656 and 1667 to provide a setting where the faithful from all over the world could gather. It still serves that purpose admirably, and is filled to capacity each Easter Sunday and on other important occasions. The large oval area, 372 meters long, is enclosed at each end by semicircular colonnades surmounted by a balustrade with 140 statues of saints. On either side of the oval are fountains, and in the center is a 25.5-meter Egyptian obelisk brought from Heliopolis by Caligula in AD 39 and set up in his circus. It was moved here in 1586, no small task in those days as the monument weighs 350 tons. The focal point, however, is the façade of the basilica, from whose central balcony the Pope delivers his blessings and announces beatifications and canonizations. From here also, the senior member of the College of Cardinals proclaims the name of a new Pope elected by the conclave. The Vatican Museums have the largest collection of ancient sculpture in the world, mainly found in Rome and the surrounding areas, most of it displayed in the systematic arrangement designed by Popes Clement XIV and Pius VI from 1769 to 1799. These galleries contain such a wealth of magnificent and significant pieces that even a list of the highlights is a long one. In the Sala a Croce Greca, don't miss the red porphyry sarcophagi of Constantine's daughter, Constantia, and his mother, St. Helen, both richly decorated with figures and symbols. In the Sala delle Muse look for Belvedere Torso, a first-century-BC work by Apollonius of Athens that was admired by Michelangelo. In the Gabinetto delle Maschere is a mosaic floor of theatrical masks from the Villa Adriana in Tivoli. In the Cortile del Belvedere is one of the most famous statues in the Vatican - the Apollo Belvedere. In the Galleria delle Statue notice the Candelabri Barberini,the finest ancient candelabras known, also from the Villa Adriana at Tivoli. Galleria dei Busti contains, along with lunette frescoes by Pinturicchio, the celebrated Laocoön group, a masterpiece of Hellenistic sculpture showing the Trojan priest Laocoön and his sons in a mortal struggle with two huge snakes. Beneath the grand dome and priceless frescoes of St. Peter's, a treasure trove of archaeological finds awaits. Many are aware of the papal grottoes just beneath the cathedral where former Popes have been entombed in private chapels, and the 12th-century church that accompanies them. What some don't know is that there are extensive ruins, which have been excavated even deeper in the earth below, revealing burial grounds from as early as the 1st century BCE. The deepest of the three levels contains a pagan burial site, and the next level up contains both pagan and Christian graves, as well as ruins including stone crypts and arches dating through the 5th century. The most significant discovery, however, is a gravesite believed to contain the remains of Saint Peter himself, a relic that the Vatican continues to excavate with painstaking care. A limited number of tourists are allowed to visit each day, and tickets must normally be purchased directly from the Vatican Excavations Office, so it is highly recommended that tourists book a pre-arranged private tour of the Vatican necropolis, which will ensure admission. The first parts of the Vatican Gardens were created for Pope Nicholas II in the 13th century, meant to be a space for peaceful reflection. Over the centuries, the landscaped gardens, grassy spaces, and orchards have grown to cover nearly one-half of the area of the tiny city-state and rival the most beautiful gardens in Italy. In addition to the formal French Garden, visitors will find many individually potted plants along the paths, which contain stunning azaleas and other lush flowers. Planted among these and in the orchard are several rare trees, including an Australian silk-oak, as well as many trees that were brought as gifts by official visitors. Perhaps the most significant of these trees is the olive tree, which was presented by the State of Israel to symbolize peaceful relations with the head of the Catholic Church. 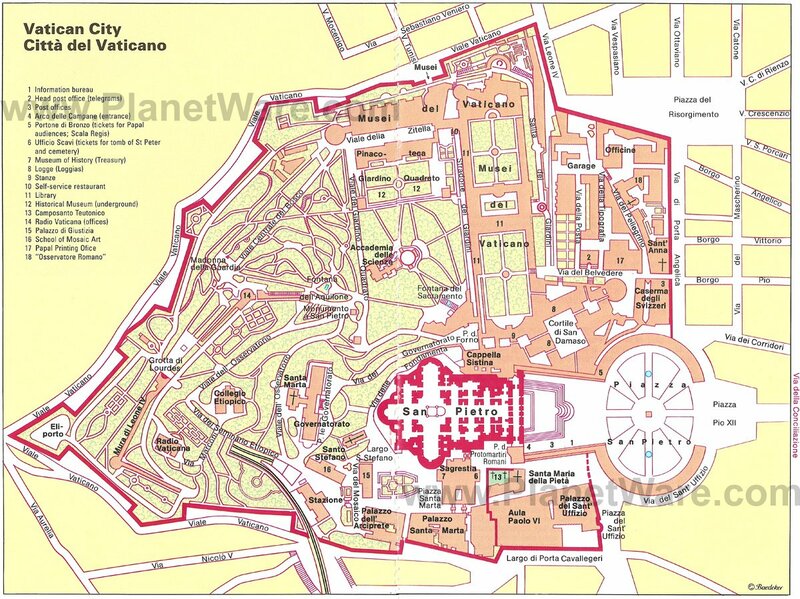 Tours in the garden must be arranged in advance through the Vatican Museum. The Etruscan Museum, founded by Pope Gregory XVI in the mid-19th century, has 18 rooms of artifacts, which shed new light on the life of the Etruscans and their idea of the afterlife. Among the findings from the Etruscan graves that have been excavated throughout Tuscany are not just funerary items, but art works and objects from the everyday life of these enigmatic people. Particularly outstanding are the grave goods found in the Regolini-Galassi tomb at Cerveteri, the Mars of Todi, a head of Athena, and a number of very fine Etruscan vases. The value of its contents makes the Vatican Library the richest in the world, with 7,000 incunabula (printed before 1501), 25,000 medieval hand-written books, and 80,000 manuscripts that have been collected since the library's founding in 1450. And that's just the old books; it doesn't count all the books it contains that were printed since the end of the 15th century. In its 70-meter-long hall, built by Domenico Fontana, you can admire some of its most precious treasures - beautiful hand-illuminated Gospels, Biblical codices, early printed books, parchment manuscripts, and ancient scrolls and papyri. The library also has a recently expanded collection of pontifical coins and medals. The Egyptian Museum in the Cortile della Pigna was re-founded in 1839 by Pope Gregory XVI, the first collection having been assembled earlier by Pius VIII. Much of the collection was brought from the Villa Adriana in Tivoli, where they had been collected by the Emperor Hadrian. Supplementing Hadrian's collections are artifacts assembled by 19th-century collectors. The compilation here isn't large, but its nine rooms exhibit some fine examples of Egyptian art from the third millennium to the sixth century BC. Highlights include basalt and wooden sarcophagi, sculptures of gods and pharaohs, bronzes, mummified heads, stelae with hieroglyphic inscriptions, statues of gods and animals, and papyri. In the last two rooms, you'll find art from ancient Mesopotamia, vases and bronzes from Syria, and reliefs from Assyrian palaces. The Museo Chiaramonti, founded by Pope Pius VII in the early 19th century, is housed in a long gallery leading to the Papal palace and in the Braccio Nuovo. Concentrating on works of Greek and Roman art, the museum includes a number of Roman copies of earlier works by some of the most famous Greek sculptors, the only record of them that survives. Among the highlights of the thousand-odd sculptures, friezes, and reliefs are the Augustus of Prima Porta, a statue of the emperor found in the villa of his wife Livia; a statue of the god of the Nile; and Spear Carrier, a copy of the work by Polycletus. In the Sala della Biga, near the entrance, are two Discus Throwers, copies of fifth-century-BC works. A funeral monument of a miller dating from the first century was found at Ostia, and two splendid gilded bronze peacocks are thought to have come from Hadrian's Mausoleum. Hotel della Conciliazione 4-star hotel, pedestrian-only street, beautiful lobby, well-appointed rooms, complimentary breakfast. Vatican View: mid-range boutique hotel, fantastic location, beautiful views, stylish rooms, luxurious bathrooms with rain showers. Caesar Palace: good-value bed-and-breakfast, warm hospitality, elegant decor, large rooms, continental breakfast with cappuccino. Adriatic Hotel: budget hotel, short stroll to Vatican City, near restaurants and a supermarket, lovely roof garden. Skip the Lines: Vatican City is an incredibly popular destination for both general sightseeing and religious pilgrimages, and as a result the lines to see the most popular tourist attractions can take longer to get through than you spend at the site itself - even after upgrading to the "fast track" tickets, where available. Anyone who is short on time, finds it difficult to stand for long periods, or simply doesn't relish the idea of a long wait will want to book the Skip the Line Tour of the Vatican Museums, St. Peter's Basilica, and the Sistine Chapel. This three-hour tour grants special no-wait access to the top Vatican attractions, allowing you to make the most of your visit by spending the entire time admiring the artwork of masters like Michelangelo and Raphael, the architecture and splendor of St. Peter's Basilica, and the treasures displayed within the Vatican Museums. The private guide will also provide fascinating commentary, which includes historical background and little-known facts about the Vatican. For those who want a more intimate experience, a small-group option is available, limited to 12 participants. Italy's Top Churches: It is no surprise that Italy is home to some of the most spectacular churches and cathedrals in the world, and you can explore some of the top churches in Rome. Italian churches draw tourists who admire the awe-inspiring architecture, unparalleled artwork, and countless treasures within. While exploring St. Mark's Basilica, one of the top attractions in Venice, you will see gold mosaics and pillars of rare stone, like alabaster and jasper, which were brought back to Venice by every merchant ship that made port during its construction. Visitors to Siena will appreciate the magnificent exterior of Santa Maria Assunta as well as the artwork that adorns the interior, the product of masters like Donatello and Bernini. Florence is home to several magnificent churches with equally impressive artwork, including masterpieces by Michelangelo, as well as impressive interiors in the lesser-known chapels, which feature intricate detail work in marble, gold, and exotic woods. Those who are inspired by architecture will also want to visit Monreale Cathedral, built in the 12th century by William II, which is one of Sicily's most famous attractions for its size and grandeur. When in Rome: While seeing the Vatican City's top attractions is a priority, there are some top attractions in Rome that absolutely can't be missed. The Colosseum is the city's most popular tourist attraction, a massive ruin that has become an iconic symbol of the city's deeply rooted history. Even older, yet in much better condition, the Pantheon has endured millennia while honoring Rome's ancient gods and goddesses, providing tourists with a truly remarkable experience as they step into the past.